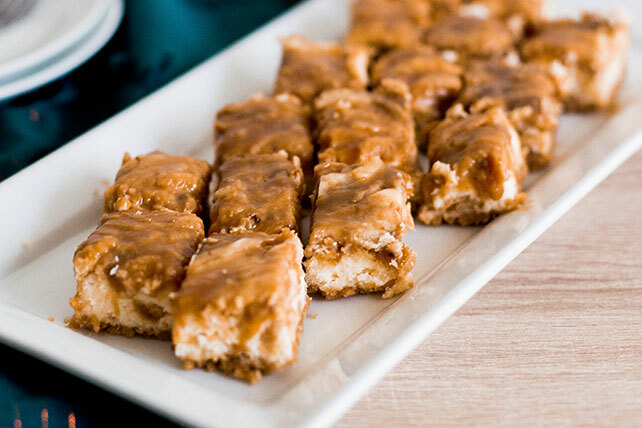 Made with melted caramels and marshmallow crème on a crunchy sandwich cookie crust, these cheesecake bars set the standard for scrumptious. Bake 20 to 25 min. or until center is almost set. Cool completely. Refrigerate 4 hours. Use foil handles to lift cheesecake from pan before cutting into bars. Substitute 1 cup KRAFT Caramel Bits for the 25 KRAFT Caramels. Enjoy a serving, 1 bar, of this cool dessert on occasion.